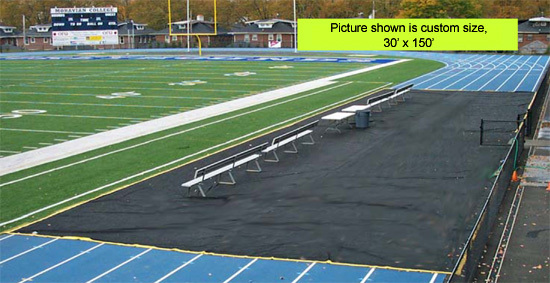 Sideline Track Protector; ideal for tracks that fit tightly around football fields. Size Border Color Tarp Body Color qty. This bench tarp/track protector resists and cushions against cleats, but still allows water to drain through. Constructed of tough polypropylene geotextile fabric with double stitched vinyl edging with steel chain inserted all around for ballast. This keeps Protector down even in high winds without stakes or staples. To reduce handling weight for easier installation, the longer models come in sections that can easily be joined with hook-and-loop strips that are double stitched along the entire length of each section's overlapping chain-free center edges. Tarp body is Black or Heather Gray. Edging in choice of White or Gold. Standard Sizes: 15' Wide x Lengths 75', 100', 125', or 150'. Custom Color Edging is Available; Chroma-Bond multi-color Imprinting is available as a bonded overlay. If interested please give us a call for further information.